Today I am joining poppies at play in their online home tour! I took some photos of our main living areas for you to see, the rooms that receive the most changes~monthly, if not weekly! This is our living/family room. 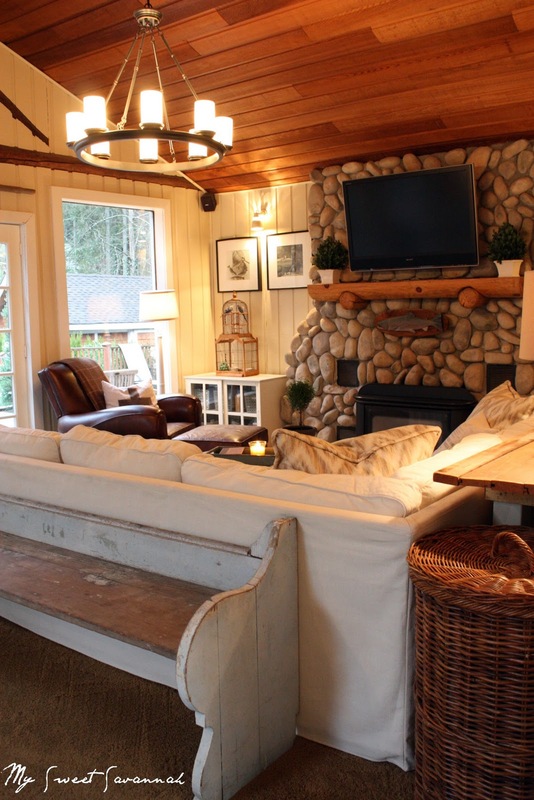 It's where we watch tv, play games, sit in front of the fire, and hang out! This wall behind our sofa continuously changes. I recently have gone through a sunburst mirror infatuation, so that is what I have up there now, along with some of my favorite family photos. I call it my wall of love! I also just got these new lamps. Don't kill me, if you've been reading my blog a while I had just purchased some fabulous chippy blue wood lamps. I have a friend who wanted them really bad, so they are now in her house. I like my replacement, a bit more contemporary, I like mixing modern with cottage. Here is our back door, which 99% of the time people use as our front door, us included. 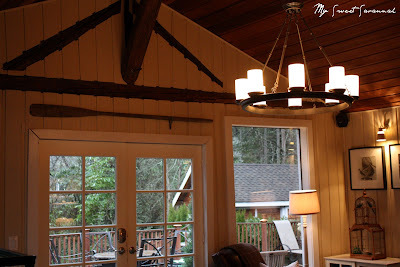 I painted the walls a while back a creamy oatmeal color but chose to leave the ceiling cedar, as well as the logs you see here above the french doors. The chandelier is from Pottery Barn. We have a massive river rock fireplace and with the exception of the summer months, we have a fire going almost all the time. It's a very cozy room. I also changed out some of the accessories on the sofa table. I love this photo of my son with his 2 front teeth missing. 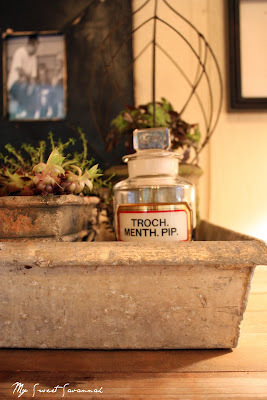 I got this cool metal box thingy from circle creek home at ruffles & rust square. My mom gave me some old pharmacy bottles, and I added these as well as succulents in chippy garden pots. I kill almost all indoor plants, but these are almost impossible to kill. I think I always have at least one candle burning at all times, it's an obsession of mine~I love yummy smells. This one is called milk and honey. All these items sit on my $5 garage sale trunk that is stocked full of magazines~another obsession! Now, moving onto the dining room which sits directly behind the living/family room. It's actually one big open room with different floors being the dividing line between the two. with these melamine Ikat bowls and plates from Target. The kids can't break them and the colors are fabulous! Another every changing wall. This little niche that sits at the top of the stairs. 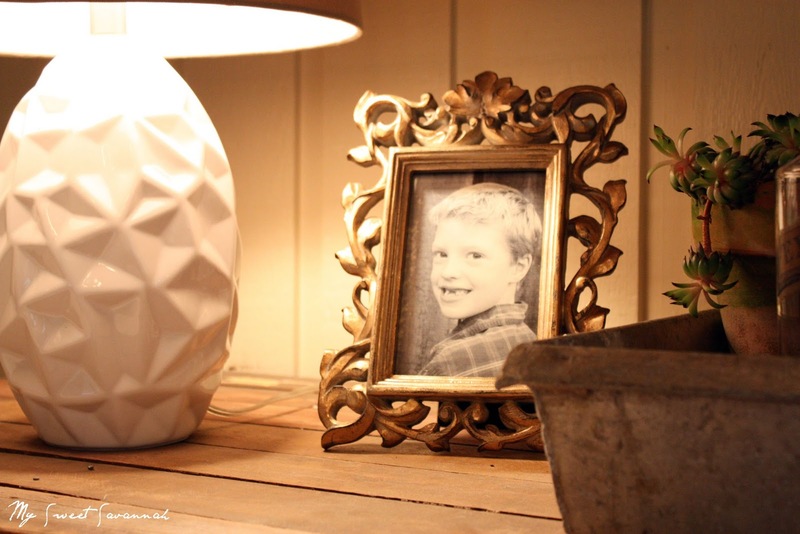 I found this great ledge/shelf at a garage sale last summer, and for now have photos of my kids in reclaimed wood frames that I made. A couple old posts are leaning up against the wall. I recently stenciled this one wall in the dining room just to add a little interest. The shelves, which are an old door cut in half, are filled with misc. flea market finds and TJ Maxx goodies. I LOVE all the light these windows bring in! They face the lake and in the summer months, the light just streams in. I have never shown this angle of the room before because of the embarrasing water damage in the skylights. I also recently found 2 caned high back chairs at a thrift store, painted them black and added a burlap coffee sack to the seats. I may do a seperate post on those later, they are kinda fun. Moving along to the kitchen which is right off the two rooms. 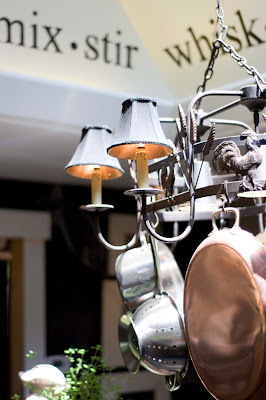 We do not have this pot rack anymore, but I like this picture because it shows the lettering around the inside of the skylight. You can also catch a glimpse of our chalkboard wall in the background, which the kids love. I have to say, I love it too! The kitchen island has a honed black granite on it and is HUGE. Eventually when money allows I'd like to update the rest of our counters with the same or maybe even butcher block. They are comfy and I just love the cross backs. A dear friend of mine made me the most adorable light leopard print seat cushions for them with a flouncy ruffle around the edge. 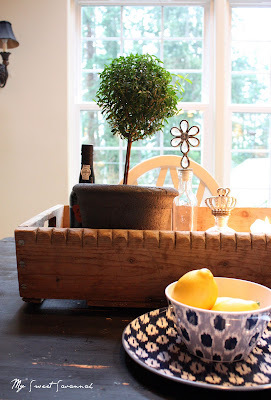 My husband trimmed out the island with mouldings and I painted and distressed it. These photos were taken prior to our mini kitchen makeover where I painted the cabinets to match and stained our floors. Next up on the list is flea market trixie! 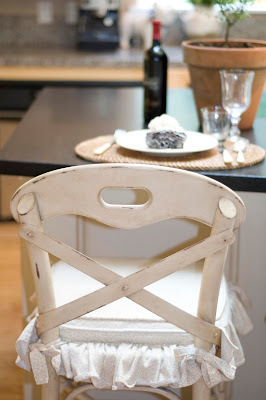 I love her home and her diy attitude, so be sure to check it out! I also wanted to let you know I will be doing the mother of all giveaways tomorrow, so be sure to stop back by, and tell all your friends! Thanks Melaine! You have such a beautiful style! I am turning green with envy looking at that cute bench behind your sofa. Lol. So cute! I am also loving your coffee table! So many cute details! I'm in love with your house Melanie. 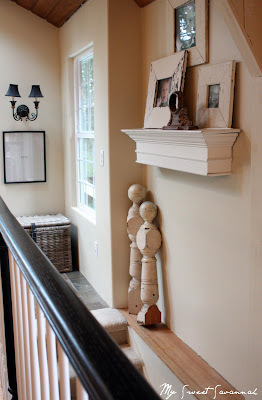 And is it weird that the first thing I thought of when I saw those posts at the top of your stairs was "those would be great to hit a burglar with if they broke into the house"? weird. Beautiful house! I love how you have brought everything together so seamlessly! An another note altogether! Can you tell me who you have playing on your blog? LOVE! I have always been a huge fan of your home! It is so warm and welcoming. I love the new angle you showed of the dining room. I love the row of windows. Hi Melaine - Your home is just beautiful and I love your creativity. You have really given it a special touch. 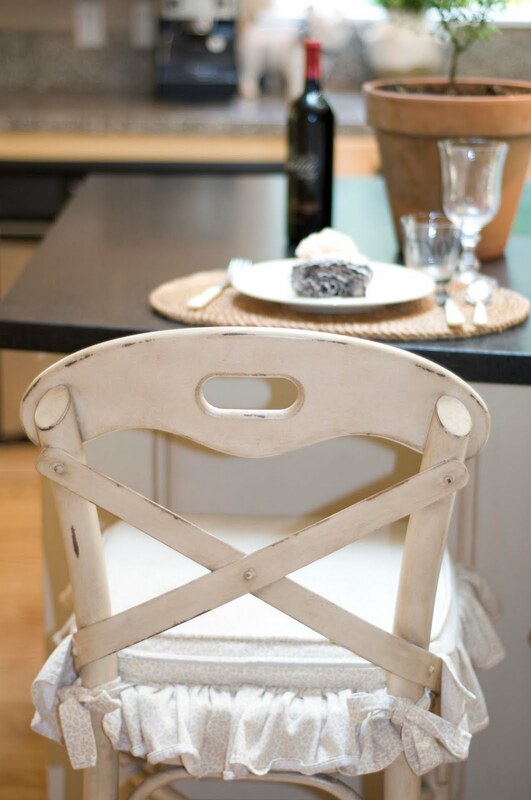 I love that you have made it beautiful as well as comfortable and practical for you family! This is one house I've always felt I could move right in and barely tweak a thing. 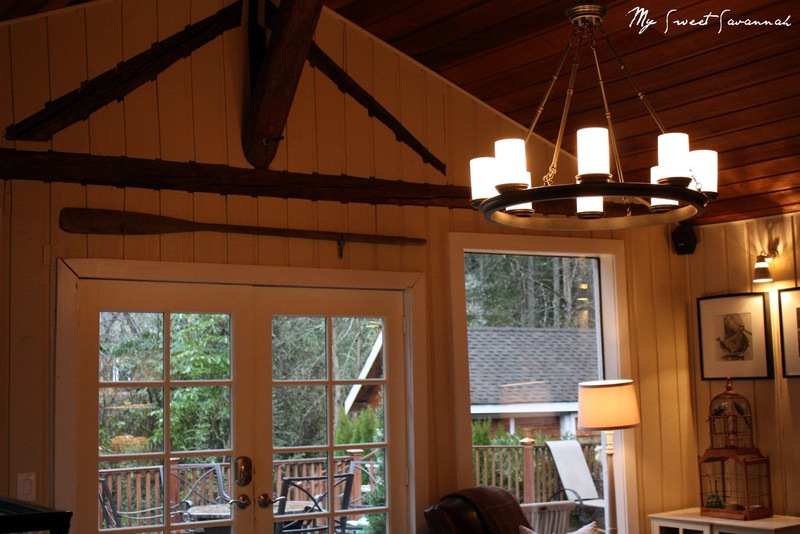 The structure, vaulted ceilings, your furnishings... beautiful yet has such casual comfy appeal. And then there's life on the lake... I know it well but from a camping perspective. I always feel a little homesick for my travel trailer days when I view your place. :) Great memories! Looks great, love the updated photos! You always have such a keen eye for mixing styles!! I think your place is very cozy and family oriented, I have always love that! I love your dining room area at the top of the stairs. 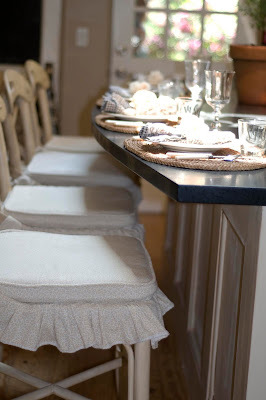 Your table set up with the chairs and the two shelves are gorgeous! I love your home Melanie! So beautiful! Do you mind sharing where you bought your wall stancil from? I have been after one for my dining room. oh, everything is just beautiful!!! Your house is beautiful! 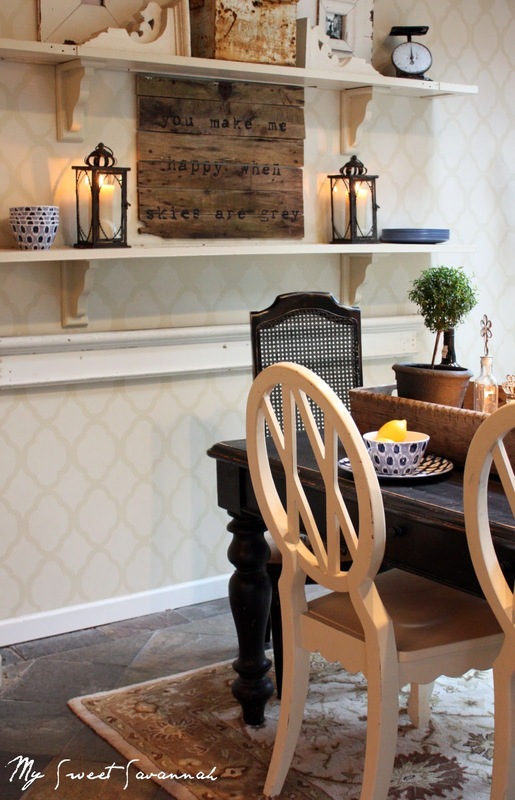 The stenciled dining room wall is fantastic!! So enjoyed your house tour! I have been a follower for a while and have not seen some of these beautiful rooms before. Thanks for sharing. love every inch of your house! 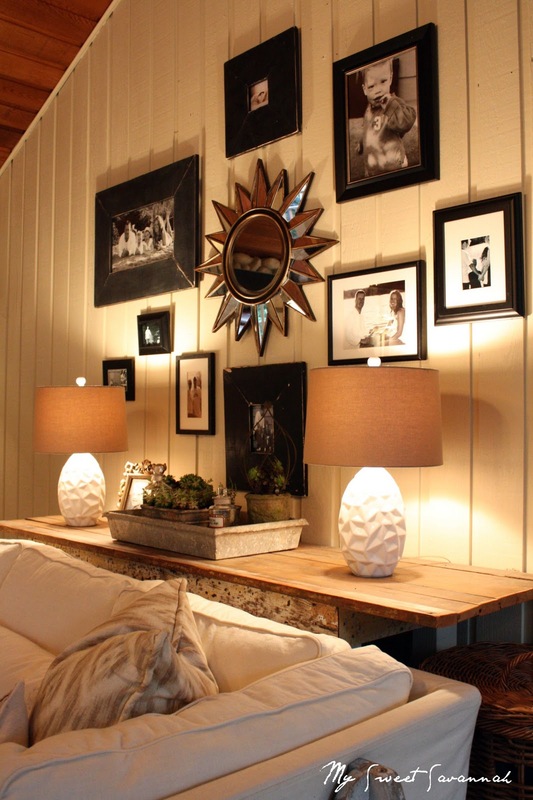 especially that ledge/shelf.... if you could figure out how it was made... please let me know. its so cozy.... keep it up and please continue to share. You and your home are both charming. I never tire of walking through your home. It is ALWAYS so warm and welcoming. I love the personalization that your own art and signs brings to each space. I love all your recent updates. Your rock fireplace always looks fabulous and timeless with your other furnishings and accents. You were one of my first inspirations when I stsrted blogging and continue to bring forth new ideas and fresh ways of looking at decor. Your house is amazingly beautiful! I love your coffee table. Everything looks so beautiful, Melaine! 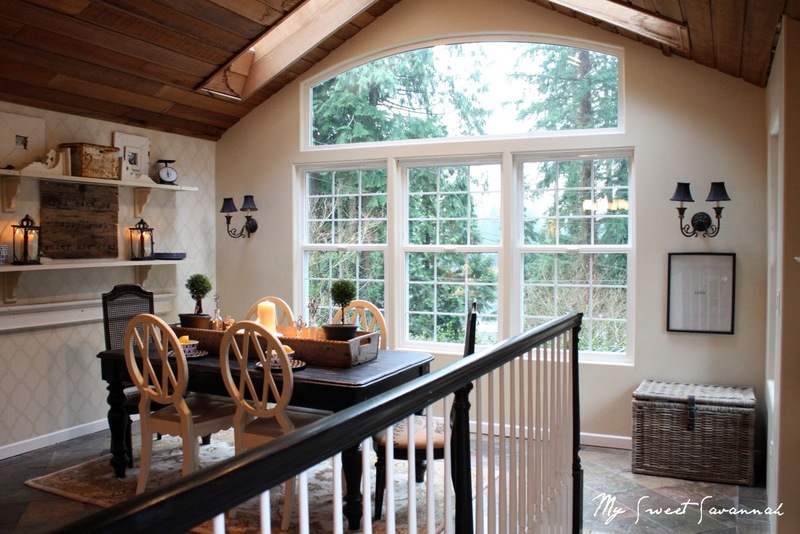 Your dining room is my favorite! I love your dining room, I don't think I've ever seen it in full before! Gorgeous! 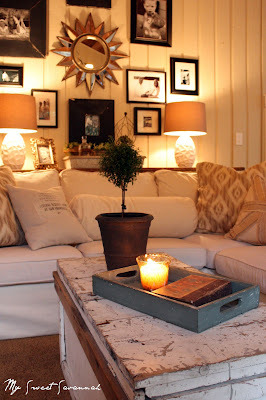 I've always loved your home, and was excited to see pics of your living/family room. The room looks very similar to ours in size and feel. Do you have wood floors? We are debating putting in a wood ceiling, and have two beams and hickory floors. Would love to see a pic if you have wood floors in there too! Your home is such a wonderful mix of warmth and comfort and eclectic style. It is always fun to catch a glimpse into your house! Thanks for coming by and entering the giveaway! Good luck and have a terrific week! 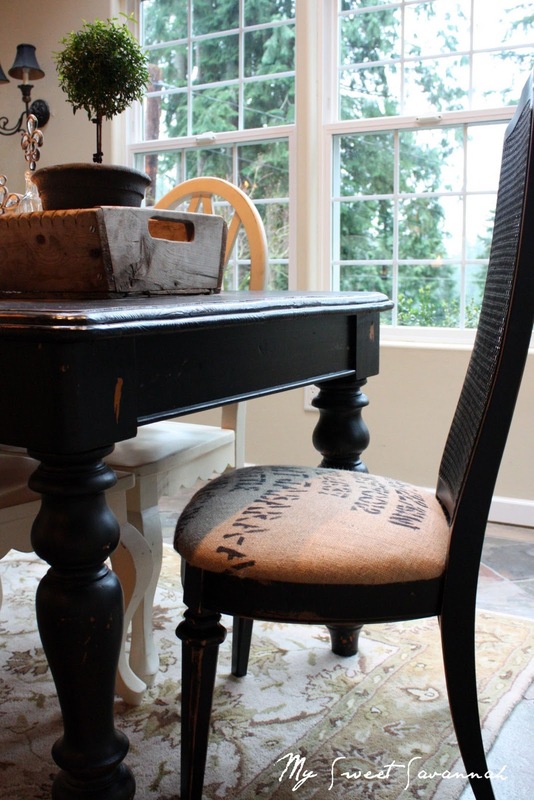 I love how you mix black and white with natural elements - it all looks so beautiful - comfortable elegance. I love your view - the lake. I could not think of a better place to live. Just came across the fun Parade of Homes and REALLY enjoyed your home tour. I'm a self-admitted blog addict and pleased to come across your beautiful blog. I'm adding it to the long list of "blogs that stimulate the senses!" What a beautiful home you have Melanie! Thanks so much for the tour...I really enjoyed it! I popped over from Make Mine Beautiful...nice to meet! Love your ikea couch sectional. I want to get that for our lake house but wondering how you keep it clean and how often you háve to wash it. The display one at pottery barn is filthy. So comfy tho. 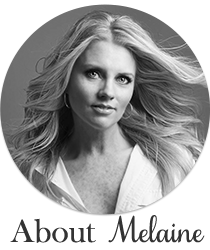 Love your home, Melanie! Everything looks so inviting and welcoming. Thanks for sharing! Thanks for sharing your home with me. I love the cozy feel that you have created for you and your family. Your home is so cozy, warm & invited. I'd love to spend Christmas there for sure! Picture perfect. Beautiful and Gorgeous House!! Thanks for sharing a glimpse of your house to us Melanie. Your home is beautiful and has inspired me in so many ways!! I just had to ask what kind of plant the topiaries you have on your dining table and throughout your home? I have a brown thumb, are they easy to keep alive?? I'm new to your blog and truly enjoy it! I am adding it to my blog favorites and hope to stop in often. I love the rock fireplace. It screams "comfort". Have you fixed the water damage in your skylights? Well, I hope so, because the longer you wait, the greater the chance of it getting worse. Likewise, you will truly enjoy looking at the topside view if your skylight doesn’t have any defects. I agree with Tiffany! Fix the damage as soon as possible and save yourself from costly repairs in the future. By the way, your house is beautiful! I hope you didn’t give up on your skylight. Hello my name is Tanya, I'm from Brazil. I want to inform you all that there is a spell caster that is genuine and real.I never really believed in any of these things but when I was losing Jackson, I needed help and somewhere to turn badly. I found consultant. [email protected] and i ordered a LOVE SPELL. Several days later, my phone rang. Jackson was his old self again and wanted to come back to me! Not only come back, the spell caster opened him up to how much I loved and needed him. Spell Casting isn’t brainwashing, but they opened his eyes to how much we have to share together. I recommend anyone who is in my old situation to try it. It will bring you a wonderful surprises as well as your lover back to you. The way things were meant to be.” you can contact the spell caster on–[email protected] he’s very nice and great. Fast and Easy Loan offer Apply now. هل أنت في حاجة إلى أموال لمشروع أحلامك أو السكن؟ هل تحتاج إلى أموال لإنشاء الخاص بك العقارات أو الرهن العقاري؟ هل تم رفض من قبل البنك أو البنوك الأخرى؟ هل تحتاج إلى أموال لعملك، والشخصية، طالبة، الاستثمار، وتوطيد الدين، الزراعة الأعمال قرض التوسع؟ هل تحتاج إلى أموال لطفلك التعليم أو لدفع فواتيرها؟ نحن منحك الفرصة لتفعيل حلمك. إذا كنت في حاجة الى قرض من أي نوع، لا اتصال بنا من خلال البريد الإلكتروني: ([email protected]) لطلب القرض الخاص بك. [email protected] and this is his website: http://homeoflightandsolution.webs.com/ contact him and get your solution now. Thank you Dr Miracle for you are indeed miraculous. Are you a business man or woman? Are you in any financial mess or do you need funds to start up your own business? Do you need a loan to start a nice Small Scale and medium business? Do you have a low credit score and you are finding it hard to obtain capital loan from local banks and other financial institutes? Our loans are well insured for maximum security is our priority, Our leading goal is to help you get the services you deserve. My name is lewis Edward, I live in california U.S.A and i am a happy man today? I told my self that any Loan lender that could change my Life and that of my family, i will refer any person that is looking for loan to Them. He gave happiness to me and my family, i was in need of a loan of $250,000.00 to start my life all over as a single parents with 3 kids, I meant this honest and GOD fearing loan lender online Mr DAVID MORRISON that helped me with a loan of $250,000.00 U.S. Dollar, He is indeed GOD fearing man, working with a reputable loan company. contact them with [email protected] OR contact +1 361-248-6711 for trust and urgent loan. Important notice to everyone that still calls Dr Ajayi Ololo Great. Go through this post of mine to know he is now the greatest and not great anymore. Because testimonies are always been posted about him and his love,caring and reliable way of helping people in the world. My name is Lewis Edward, I live in California U.S.A and i am a happy man today? I told my self that any Loan lender that could change my Life and that of my family, i will refer any person that is looking for loan to Them. He gave happiness to me and my family, i was in need of a loan of $250,000.00 to start my life all over as a single parents with 3 kids, I meant this honest and GOD fearing loan lender online Mr DAVID MORRISON that helped me with a loan of $250,000.00 U.S. Dollar, He is indeed GOD fearing man, working with a reputable loan company. If you are in need of loan and you are 100% sure to pay back the loan please contact him [[email protected]]. and inform them MR Lewis Edward directed you, contact them with morrisonloa[email protected] OR contact +1 361-248-6711 for trust and urgent loan..
My boyfriend of a 4yr just broke up with me and am 30 weeks pregnant.I have cried my self to sleep most of the nights and don’t seem to concentrate during lectures sometimes I stay awake almost all night thinking about him and start to cry all over again.Because of this I end up not having energy for my next day’s classes ,my attendance has dropped and am always in uni and on time.Generally he is a very nice guy ,he ended it because he said we were arguing a lot and not getting along.He is right we’ve been arguing during the pregnancy a lot .After the break up I kept ringing him and telling him I will change.I am in love with this guy and he is the best guy I have ever been with.I’m still hurt and in disbelief when he said he didn’t have any romantic feelings towards me anymore that hurt me faster than a lethal syringe.He texts me now and then mainly to check up on how am doing with the pregnancy,he is supportive with it but it’s not fair on me, him texting me as I just want to grieve the pain and not have any stress due to the pregnancy.i was really upset and i needed help, so i searched for help online and I came across a website that suggested that Dr Unity can help solve marital problems, restore broken relationships and so on. So, I felt I should give him a try. I contacted him and he told me what to do and i did it then he did a spell for me. 28 hours later, my bf came to me and apologized for the wrongs he did and promise never to do it again. Ever since then, everything has returned back to normal. I and my bf are living together happily again.. All thanks to Dr Unity. If you have any problem contact Dr.Unity now and i guarantee you that he will help you.Email him at: [email protected] ,you can also call him or add him on Whats-app: +2348071622464 ,His website: http://unityspelltemple.yolasite.com . OUT OF FINANCIAL MESS WITH THE HELP OF MARTINEZ LEXIE ([email protected] OR +18168926958). I am a spell caster called Dr Ajayi Ololo, I was called upon by the spirits to become the chief priest of this temple when i was 18 years of age, and now i am almost 60 years old man. I am telling this to the world to make them know that this temple has been in existence for years now and we have been durable and truthful to all as we dont want you to come seek for help here and be afraid of what will happen next. Our work here is helping anybody to getting there heart desire, Over here in this temple we grant anything you want us to do for you and when you come to this temple you must see result of our work. NOTE: TO THE ONES THAT HAS BEEN DECEIVED BY THOSE ONLINE SCAMMERS, DO NOT COMPARE THIS GREAT TEMPLE WITH ANY OTHER SPELL CASTER THAT HAS RIPPED YOU OFF YOUR MONEY BY CLAMMING TO BE SPELL CASTERS. THEY ARE ALL FAKE AND SCAMMERS ONLINE THERE THAT WANT TO RIP WERE THEY DID NOT SOW, COME TO OLOLO SPELL CASTING TEMPLE AND GET YOUR HEART DESIRE WITHOUT STRESS. In this temple, we work with the spirits in the spiritual realm and they tell us how to solve any problem that you are facing and also i will want you to NOTE: THAT THIS SPELL CASTING DO NOT HAVE ANY SIDE EFFECT ON ANYONE, BUT JUST TO GET YOUR HEART DESIRE AND BE HAPPY. I Dr Ajayi Ololo urge you all that has the following problem 1.} We heal barrenness in women and disturbing menstruation 2.} Get you marriage to the lover of your choice 3.} Guarantee you win the troubling court cases & divorce no matter how what stage 4.} Ensure success in work and business 5.} Mental illness & bewitched 6.} Can?t sleep at night or walking at night 7.} Recover stolen property and whereabouts of people that hurt you. 8.} Bring supernatural luck into 9.} Extreme protection for those doing dangerous jobs like security guards, Bank manager, cash transporters, To mention but a few.11. Get your scam money back 12.} Bring back lost lover, even if lost for a long time 13.} Remove bad spells from homes, business & customer attraction etc. 14.} Get promotion you have desired for a long time at work or in your career.16.} Remove the black spot that keeps on taking your money away 17. Find out why you are not progressing in life and the solution 18.} Eliminate in family fights 19.} Ensure excellent school grades even for children with mental disabilities 20.} Stop your marriage or relationship from breaking apart 21.} I destroy and can send back the Nikolos if requested 22.} . COME HERE AND SOLVE ALL YOUR PROBLEMS HERE AND GET ALL YOUR HEART DESIRES HERE WITHOUT ANY-SIDE EFFECT ON IT. ANY KIND OF PROBLEM YOU ARE FACING IN LIFE SEND YOUR EMAILS TO: [email protected] . to get it solved in the next 5 to 6 hours. Warm Regards to all that has lost there job, lost there lovers, the ones that are battling with examination to pass, you need to win a lotto, you need to do death spell for your enemy, you want to get what your heart desire without working nor doing anything to get it, With the help of Dr Ajayi Ololo, Theses problems are solved.. Cos over here in this great temple that is know world wide as the best and greatest spell caster temple, There is no problem that do not have a solution when you come to this temple OF OLOLO. I will also want all of you to know that there are so many swindlers / scammers that has claim to be spell caster, Just to get money from those that need help. I also come to tell you to beware of these so called temples online that can never help you solve your problem. I Dr Ajayi Ololo will want to tell you all that there iS no spell caster online that can ever be like us, Cos we have helped so many individuals to get all there heart desire online. Anyone that require the help of our services should kindly send an email to the following email address: [email protected] . EZRA SEBASTIAN LOAN HOME, ([email protected]) aims is to provide Excellent Professional Financial Services. After being in relationship with markiss for seven years,he broke up with me, I did everything possible to bring him back but all was in vain, I wanted him back so much because of the love I have for him, I begged him with everything, I made promises but he refused. I explained my problem to someone online and she suggested that I should rather contact a spell caster that could help me cast a spell to bring him back but I am the type that never believed in spell, I had no choice than to try it, I mailed the spell caster, and he told me there was no problem that everything will be okay before three days, that my ex will return to me before three days, he cast the spell and surprisingly in the second day, it was around 4pm. My ex called me, I was so surprised, I answered the call and all he said was that he was so sorry for everything that happened, that he wanted me to return to him, that he loves me so much. I was so happy and went to him, that was how we started living together happily again. Since then, I have made promise that anybody I know that have a relationship problem, I would be of help to such person by referring him or her to the only real and powerful spell caster who helped me with my own problem and who is different from all the fake ones out there. Anybody could need the help of the spell caster, his email: [email protected] you can email him if you need his assistance in your relationship or anything. I CAN NEVER STOP TALKING ABOUT HIM, HIS EMAIL ADDRESS IS: [email protected] CONTACT HIM NOW FOR SOLUTION TO ALL YOUR PROBLEM, HE ALSO HELP PEOPLE TO GET PREGNANT. Hello and blessed are you who found me. My name is DR OTIS DARKO ( [email protected] ), and am here to help you change and transform your life in the most positive way possible. I use the power of white, black craft and Wicca and voodoo spell casting to help people just like you they get the love they want and the money they deserve. You may have already tried the power of spells and prayers to get what you want. Although it is true that everyone has the ability to cast spells and perform magic, spell casting is like a muscle. Everyone has this 'muscle' but the more you use it, the stronger it gets, and the more things you are able to do with it. If you are not an experienced spell caster, your spell may not be as strong, and the results not as quick as you may desire. GET YOUR PROBLEMS SOLVE HERE AND BE FREE!! Hello my name is Collins Guzman from London i know a renowned spell caster who helped me when i had problems in my marriage with my Wife. If you need a right place to solve your relationship problems contact DR.OGUDUGU TEMPLE on: ( [email protected] ) OR WHATSAPP +2348139793075 he is the right choice, he is a great man that has ever been. FINANCIAL RESTORATION THROUGH THE HELP OF JASON RAYMOND OF FUNDING CIRCLE LOAN INC: ([email protected] OR Call/Text +14067326622)..
Hello my respectable Viewer,i am writing this article to tell the world on how Dr.Zuku brought my Ex Boyfriend back to me,This is the reason why i have taken it upon myself to thank this great spell caster called Dr.Zuku because through his help my life became more filled with love and i am happy to say that my Ex Boyfriend who has been separated from me for the past 3 year came back to me pleading for acceptance from me, This was a shocking event because before i contacted Dr.Zuku i was the one begging my Ex Boyfriend to come back to me but through the assistance of Dr.Zuku i now have my relationship restored. You can also have a better relationship only if you contact: [email protected] his Mobile number +16177296273 or visit Dr.Zuk blog. https://drzukuspelltemple.blogspot.co.ke/ .. I was in total despair when I found Dr. Todd. My life was going terrible and I didn't know if I was coming or going. I had just gone through a rough divorce, wasn't making enough money to sustain me and my children, and my 17 year old son had just gone to jail for the first time. When I talked to him, I immediately found a sense of peace. He was very honest with me and I could feel that. He also told me that everything would be okay. After my work began, things began to change. My bills were all caught up, the relationship I was in became much stronger, I was never FLAT broke, and my son was released from jail earlier than we expected!! I also completely got over the failed marriage and began to move on. And, received a better position at my job which will cause an $800 per month increase!! I felt completely comfortable with the work that was being done because I was always encouraged by Dr. Todd. [email protected] is the BEST!!!! NOLAN GREY-SON LOAN HOME, ([email protected]) aims is to provide Excellent Professional Financial Services. Are you from America, Europe, Asia Pacific, Africa, Middle East or were ever you are from on earth. I am happy to display my identity that contains my pictures, email address and my home address. Its shocking to me till this moment that i finally won $15,000,000.00 after going to so many places here in the states to get help to make me win lottery in a very easy way. I know many people in the states and in the world has given up on trying to win a lottery or have given up trying to contact a magician or a spell caster for any kind of help to solve any form of difficulty. If you are one of them,you are right by given up. i did give up before on trying to win a lottery,because it was never favorable for me at all as i will always not win. Because i have never won as i have tried my luck several times,i have to go seek for the help of a magician here in the states and i used three magicians to try to win but still to no luck and i spent close to $6,200.00 dollars on the magic help i was getting from this woman here is Florida still no win for me as her magic was not powerful enough to enable me win a lottery. At this point i was devastated and don't know what to do again that can help. After a deep thought again that i am not getting younger, Something inside me said to me that i must not give up on my dream to win millions on lottery someday. My problem was now, Since i can not win lottery with my natural luck and i have tried a magician face to face here in Florida, What will i do next was the question i begin to ask myself for weeks till i stumble on a post by some spell caster that he can grant ones help on anything. I contacted him and he also worked for me and still no luck for me to win lottery after spending almost $2,800.00 dollars on the spell he promised to cast for me to win lottery. To everyone out there, This is my main focus and why i took it upon myself to parade the internet just to tell everybody that needs a spell caster online to be very very careful and know that there are more of lies and fraud spell casters online than just the ones that are real that can grant you 100% result if you contact them. Coming online to seek for a spell caster to cast a spell for me to win lottery was another disaster to me as i was deceived by four spell caster that made away with almost $7,800.00 dollars without result. It was my wife that now came home and showed me the testimony of Mari her colleague in the office refereed her to that won just the sum of $75,000.00 with the help of a spell caster called Dr Ajayi Ololo after telling him about how i have tried to win a lottery. My wife advised me and begged me to give the spell caster a try that she know that i have been hurt badly by other fake spell caster and magician in the past, That she was told that this spell caster called Dr Ajayi Ololo make the impossible possible in life as that is his work and his work is 100% guaranteed to get any form of help from him. Really we contact him and he send us a form to fill out after almost 2 hours of contacting him and we did all he instructed and in just 48 hours he called me personally on the phone to tell me that he is done with my work that i can go try my look that i will win noting less than $15,000,000.00. To me i was just like i have heard all this before either from the magician here or the fake spell caster parading themselves to be to real before. But i did went to try his work and with all heavenly truth his words came to pass just as he has said it. Till this moment all, My mouth is not wide enough to say thank you to him because he really prove to me that there are still hard working spell casters that can make the impossible possible in life. Just email [email protected] to resolve and grant permanent solution to that problem. WELCOME TO PATRICIA KINGSMAN [email protected] our aims is to provide Excellent Professional Service. Is the difficulty of the economy affecting you this year,? If your answer is yes, then you need a loan. I’m Mrs Patricia Kingsman, the owner of a lending company We offer safe and secure loans at an interest rate of 2%. We are a financial consultant that handles international finances for any amount of banking instruments. We have the access/contacts to raise from $10 thousand to $500 Million Dollars, With our company (Patricia Kingsman loan company) and other TOP PRIME AA BANKS like Bank of America, HSBC, Lloyds, Wells Fargo, The Best Banks for SBA Loans etc.